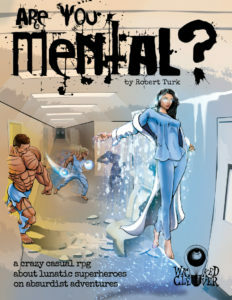 “Are You Mental?” is a crazy, casual, silly fun, no-prep role-playing game about lunatic superheroes on absurdist adventures. It uses two decks of cards (included) and all the dice you own (not included.) An average game takes about 2 hours, for 3 to 8 players ages 13 and up. This is a game that doesn’t take itself seriously or anyone else for that matter. And it can be played by absolutely anyone, even those people who DON’T play traditional role-playing games! The rules are as light and easy to grasp, with enough randomness to be totally out of control, yet enough structure to be an absolute blast to play. “Are You Mental?” also makes for a great pick-up game for those nights when you just don’t want to invest in a serious or long-running campaign. It works great for transitioning friends from party style games to the RPG genre, and can really save your bacon if a crucial player for your dark and brooding Vampires in Space game bails unexpectedly and you still want to rock the evening without them!